"in one sense these objects were concrete manifestations of the weirdly conceived but realistically drawn enigmas in the paintings of de chirico, dali, magritte… they were also deliberate dislocations of reality, in the spirit of lautreamont’s image…"
objects, like a house, are personal and cultural artifacts reflecting our values and in turn influencing us. ugo la pietra often played with the perception of space and the way in which we influence the urban environment and vice versa. He titled several of these experimentsdisorienting system. in 1974, one year after the monumental group show italy: the new domestic landscape, la pietra attempted to form a new living strategy with his installationoccultamento. the concept, reminiscent of japanese residential design, treats an enclosed space as a staging ground for daily activities. however, rather than filling space with objects from outside the room (as was often the case in traditional japanese design), la pietra envisions a way of pulling surfaces out of the walls and floors to create a table, bed or chair. this became an excercise in altering the perception of what a bedroom could look like or how it could function. artists, architects and designers all over the world in the 60’s and 70’s obsessed with mobility. la pietra’s occultamento is no exception. this bedroom scene can constantly shift to the user’s needs. the theme of mobility and change also necessarily imposes a sort of timelessness – something superstudio’s adolfo natalini expressed in his essay, a house of calm serenity, as a desire to create a house that is “for all seasons.” surrealist histroian marcel jean might have described such spaces as “points of reference of a universe which is separate from everyday life but still connected to it by the taut, solid threads of desire.” this representation of mobility both reflects and influences the viewer, disorienting their perception of space and function and creating a new landscape for all seasons – a sort of radical architects’ surrealist bedroom. CONTRA MUNDUM I – RUPERT DEESE MAY 3, 2009 7PM An Other Interior: Spatial Objects Rupert Deese, artist and former fabricator for Donald Judd, discusses building and living with the furniture of Judd, Gerrit Rietveld, Josef Albers, and Gerald Summers. sure wish i’d of seen this talk last spring. d.i.t.c @ a.a.p.c. Judd, Gerrit Rietveld, Josef Albers, and Gerald Summers. unfortunately, it’s not on the tubes. it’s like a superstudio grid warping. gianni pettena’s third and final act out west in utah about non-conscious architecture would be a documentation of elementary structures – mountains made by nature or simple industrial structures built purely based on engineering principles. in essence, pettena catalogued “works of architecture not made by architects”. pettena was interested in utilitarian structures, constructed “because that was the most practical and convenient solution, and for no other reason”. the results, a challenge to traditional european values of architecture, were shown as a movie during the 1973 milan triennale. 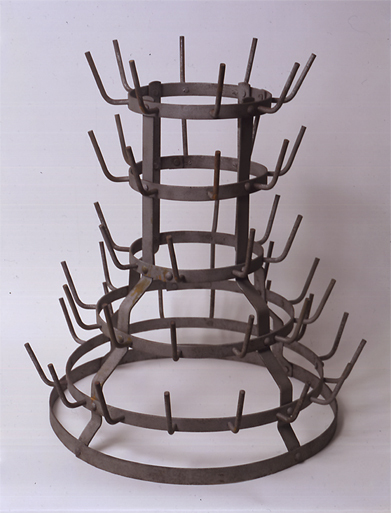 pettena’s non–conscious architecture embodies the same rebellious and playful spirit ofduchamp’s early readymades, like the shovel and wine rack. he brings value and significance to these otherwise unnoticed pieces of architecture – manmade or naturemade. and, like the readymades they are decidedly utilitarian in character, devoid of social moorings. several other artists in italy were exploring this same anti-consumerism in the early 70’s. while writing aboutsuperstudio’s histograms, adolfo natalini said, “by the destruction of objects, we mean the destruction of their attributes of ‘status’ and the connotations imposed by power so that we live with objects… and not for objects”. about non-conscious architecture finished as a wandering exhibition. the movie frames were printed, organized and bound as a catalogue of new architectural typologies called already seen portable landscapes. this set of photos, reminiscent of bernd and hilla becher’s own typological studies, were placed in a suitcase and carried around “as baggage that served as a reminder, above all for the person who had had that experience, of the story of a particular moment of readiness to look at physical space in an unconventional way”. “E.M.E (Earth-Moon-Earth) is a form of radio transmission whereby messages are sent in Morse code from earth, reflected from the surface of the moon, and then received back on earth. The moon reflects only part of the information back – some is absorbed in its shadows, ‘lost’ in its craters. For this work, Beethoven’s Moonlight Sonata has been translated into Morse code and sent to the moon via E.M.E. Returning to earth ‘fragmented’ by the moon’s surface, it has been re-translated into a new score, the gaps and absences becoming intervals and rests. this piece especially but, really loving all the work of katie paterson. here’s a movie clip of this work. there’s more about the artist and an interview in this this. Stephen Kaltenbach PEP TALK is an important new resource on the mysterious and legendary, if under-recognized, conceptual artist. This special monographic issue includes three interviews with Kaltenbach: one by Cindy Nemser (reprinted from its original 1970 appearance in Artforum); a discussion between the artist and Peter Eleey, Curator at the Walker Art Center; and a conversation with a Pep Talk listener. Also printed are past notebook entries by Kaltenbach’s friend and artist peer Lee Lozano, a scholarly essay by writer and art historian Edward Sterrett, and enthusiastic notes from the editors. With over 45 image reproductions, this Pep Talk represents the most comprehensive survey to date of Kaltenbach’s early work and continuing practice. It is Pep Talk’s honor to present the work of this mind-blowing, hilarious, and totally brilliant artist. if you’re interested in stephen kaltenbach, at $6, this is definitely worth seeking out. 1. "The line between art and life should be kept as fluid, and perhaps indistinct, as possible." ——— 2. "…the problem with artlike art, or doses of artlike art that still linger in lifelike art, is that it overemphasizes the discourse within art." same truism was headlined every time we saw a stack of industrial products in a gallery, every time daily life was enacted on a stage: that anything can be estheticized, given the right art packages to put it into. But why should we want to estheticize “anything”? All the irony was lost in those presentations, the provocative questions forgotten. To go on making this kind of move in art seemed to me unproductive. “Now I’m making art! !” But in actual practice, I didn’t think much about it. my daily life was just as routinized and unnoticed; that my mind was always somewhere else; and that the thousand signals my body was sending me each minute were ignored. I guessed also that most people were like me in this respect. How is this relevant to art? Why is this not just sociology? It is relevant because developments within modernism itself let to art’s dissolution into its life sources. Art in the West has a long history of secularizing tendencies, going back at least as far as the Hellenistic period. by the late 1950s and 1960s this lifelike impulse dominated the vanguard. Art shifted away from the specialized object in the gallery to the real urban environment; to the real body and mind; to communications technology; and to remote natural regions of the ocean, sky, and desert. Thus the relationship of the act of toothbrushing to recent art is clear and cannot be bypassed. This is where the paradox lies; an artist concerned with lifelike art is an artist who does and does not make art. ‘zen for film’ (1962-64) by nam june paik is a film with no script, no narrative, no sets, no actors, no sound, no camera, no montage – but with screen and projector, and most certainly on film. a film with no script, no narrative, no sets, no actors, no sound, no camera, no montage – but with screen and projector, and most certainly on film. i’ve been sort of obsessed with thinking about this.